If you have not yet read part 1 of our tribute, where we explored the reasons behind the characteristic red hue of these diamonds and their countries of origin, you can find it here. 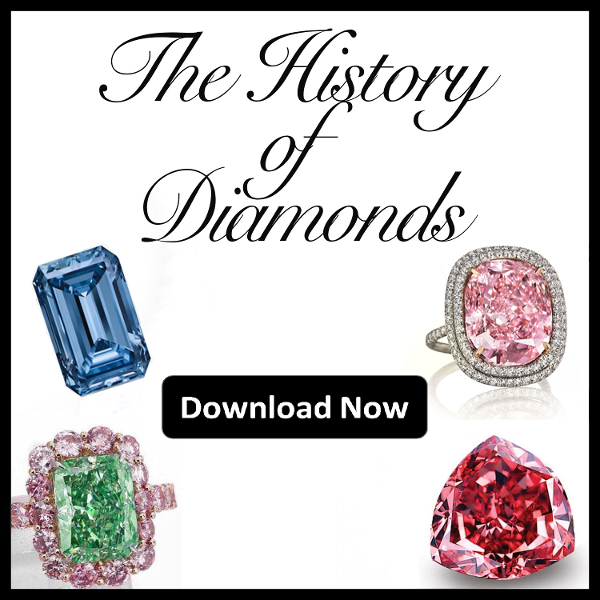 In this second part we will be exploring some of history’s finest red diamonds, as well as the story behind each individual stone. Found in the in the Alto Paranaiba region of Brazil during the 1990’s this gem initially stood at 13.9 carats. 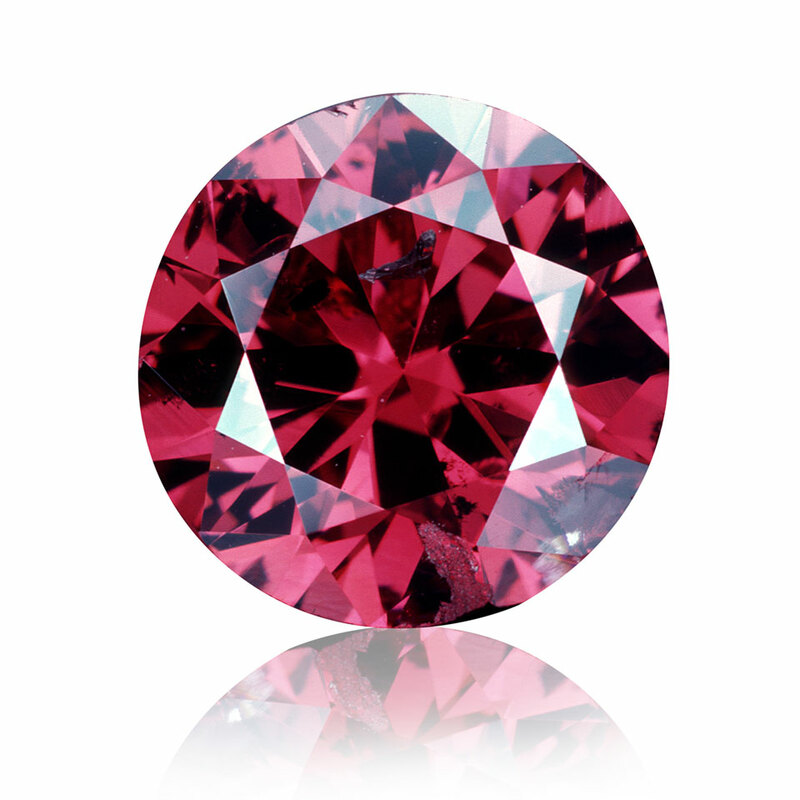 It was later attained by the infamous William Goldberg Diamond Corporation which ultimately refined the piece to a magnificent 5.11 carat red stone originally named the “Red Shield” and according to the Gemological Institute of America, it is still the largest fancy red diamond measured up to date. As its name suggests, this stone has a triangular brilliant cut (also known as a trilliant cut) and has an internally flawless (IF) ruby red hue. 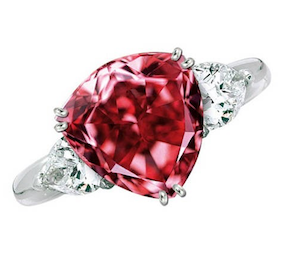 The diamond was eventually sold to its current owners “Moussaieff Jewelers Ltd.” during late 2001, early 2002 for approximately $8 million (that is almost $1.6 million per carat) and was ultimately renamed “Moussaieff Red”. Finally, during 2003 the diamond was put on display at the “Splendour of Diamonds” exhibition in the Smithsonian Museum in Washington D.C. Originally discovered in Lichtenburg, South Africa during the mid-1920s this stone was thought to be a 35 carat black bort and was sold for just £8 per carat. It was later sent to the Gaudvis Brothers in Amsterdam who begun processing the stone. 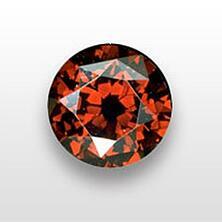 Once the stone was reduced to 23 carats it begun developing a brown hue. Noticing this, cutting operations proceeded until it was transformed into a 5.05 carat, deep ruby red, emerald cut diamond. 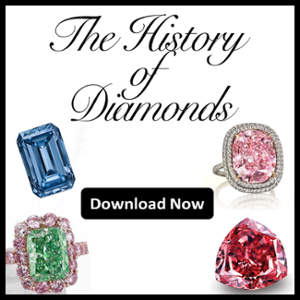 Despite its brilliance, and contrary to the other diamonds on this list, this stone story is plagued by tragic events. 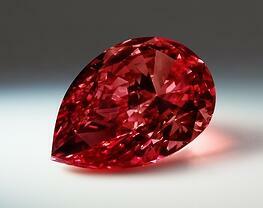 It initially received very little respect, and was often mistaken for a ruby by a plethora of untrained individuals. To make matters worse, it was even confiscated by Nazi soldiers during WW II. Thankfully, it was returned to its rightful owner after the war had ended, but it ended up being repeatedly sold up until 1970. After disappearing from the public eye for 37 years the diamond was offered to the Kazanjian Bros. a gem and jewelry firm based in Beverly Hills, California. 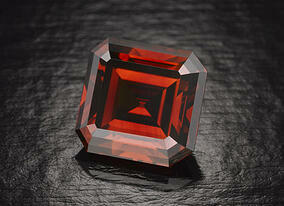 Following its 2007 purchase the stone was then named the “Kazanjian Red” to pay homage to the company’s founders. Despite its tragic past, this precious stone now has a noble role; often displayed alongside other famous gems and jewelry, the company utilizes its brilliance to promote and raise money for various charities, some of which being related with underprivileged youth and disadvantaged children. Weighing at 5.03 carats this is the third largest diamond on our list. It has a vibrant red color with a slightly brown tint. What makes this stone stand out the most is its horizontally divided kite shaped facet. This is another diamond that had rather humble beginnings. Originally sold at an estate sale it was mistaken for a garnet pin for hats. Thankfully, after close examination by its sole owner, Sidney De Young, a Boston based jeweler, the stone was officially recognized to be a brilliant red stone. De Young ultimately donated this diamond to the Museum of Natural History in Washington D.C. Believed to have originated from Brazil, this 0.95 carat diamond has a sweet red color with a purple hue. The original owner of this stone was Warren Hancock, a diamond collector and rancher located in Montana. He had originally obtained the diamond at a local jeweler during 1956 for $13,500. What is most noteworthy about this diamond however, is its record breaking bid during a 1987 auction. 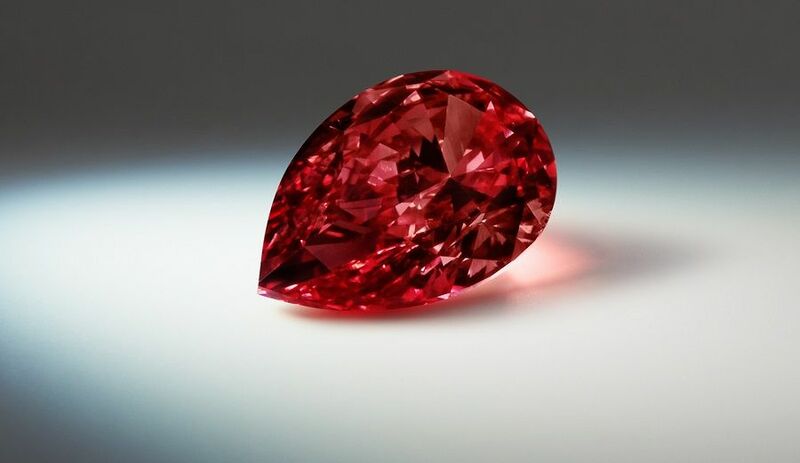 The stone sold for a record $880,000 (this translates to slightly over $926,000 per carat) and was documented to be the first high quality red gem to be sold at an auction. At only 0.59 carats, this pear shaped stone is the smallest diamond on our list. You may think that there is no way such a small diamond can compare to those mentioned above, however we saved the best for last. Named after its owner, Robert Bogel, this stone holds a VS1 clarity grade. 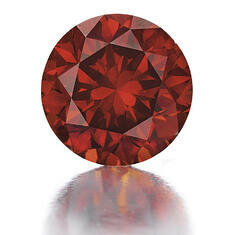 This means that among every single fancy red diamond documented globally, the “Rob Red” has the absolute highest grading regarding color clarity and saturation, deeming this stone as the most unique out of all the red colored diamonds. The above mentioned can be further supported by Stephen Hofer, a renowned gemologists and author of “Collecting and Classifying Fancy Colored Diamonds”. He officially reported that that this is the purest and most saturated red stone to be visually and instrumentally measured to date on a global scale. One thing stands out from the above categories, and that would be the astounding price/carat ratio these diamonds possess. This however, is only natural as unique composition coupled with immense rarity and diminishing supply constitute immense value, which in turn yields very high price tags often exceeding $1,000,000 per carat. 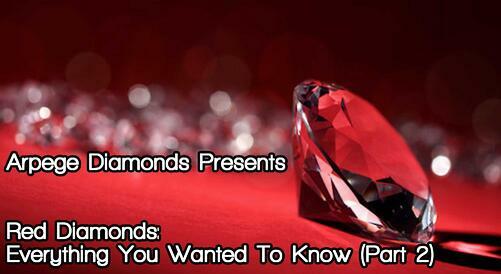 We hope you enjoyed our tribute to these beautiful diamonds and found it informational, as well as entertaining. Also, what tribute would you like to see next? Where there any additional facts you would like us to add? Let us know by either leaving a comment below or by following us on our social channels, Twitter and LinkedIn! If you are interested in reviewing our naturally colored red diamonds available for sale, please contact us at 866-821-5508.